According to a new meta-analysis – that means a review of mountains of research studies – published in the Journal of the Academy of Nutrition and Dietetics on Thursday, Jan. 22, 2015, adopting a vegetarian diet causes weight loss, even in the absence of exercise or calorie counting. The review analyzed 15 studies, conducted with 755 participants in Europe and the United States. Varying in length, from four weeks to as long as two years, the studies revealed an average weight loss of 10 pounds over a 44-week period for those following a vegetarian or vegan, plant-based diet. Remember, this was without the layer of calorie counting or ramping up exercise. Several years ago I interviewed a plant-based doctor who had devised a brilliant rule for deciding what was to put on his plate that would keep him well fed yet trim. He told me his rule: “I eat foods with fiber”. If it didn’t have fiber in it, it didn’t make its way to his plate. 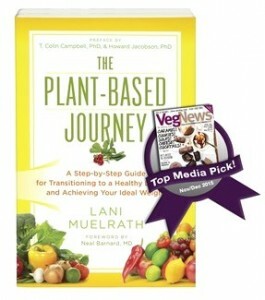 Everything on a whole foods plant-based diet is inherently fiber rich. 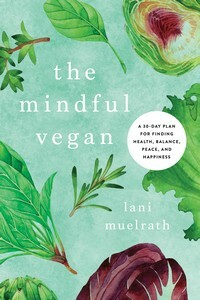 Animal products – meat, eggs, dairy – are all completely fiber free. 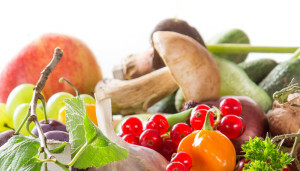 Highly refined foods are right in there with coming up seriously devoid if not completely absent of fiber. Also juices and vegetable oils. 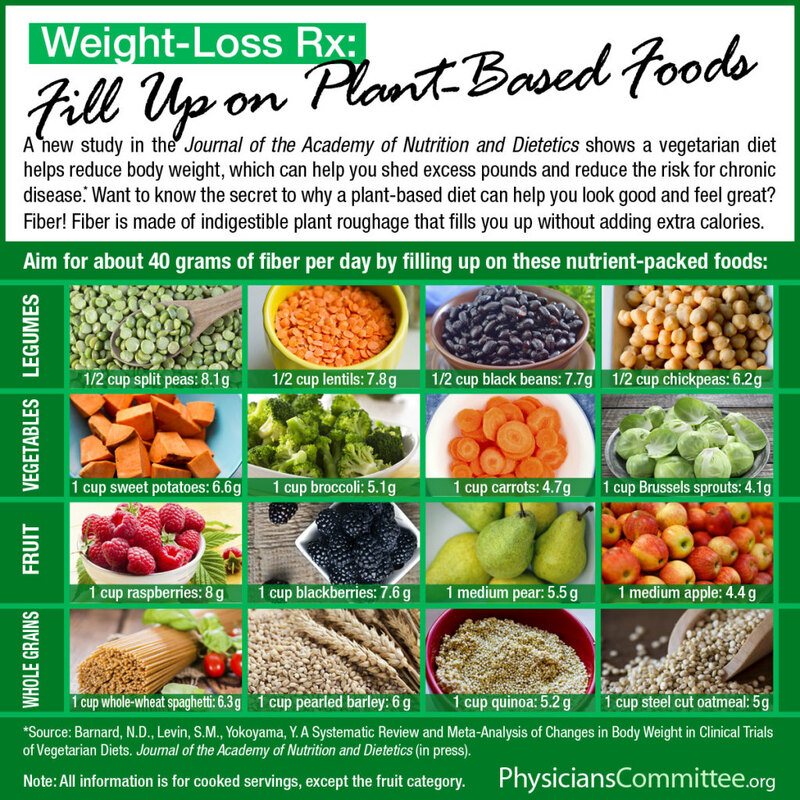 Perhaps the strongest reason people lose weight more easily on a plant-based diet than other dietary approaches is because of the fiber content of a plant-based diet. Though most Americans consume a pathetic 10 – 15 grams of fiber a day, if that – The Physicians Committee recommends consuming close to 40 grams of fiber a day. 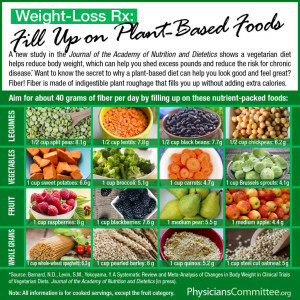 Consuming this amount of fiber is easy to do when vegetables, fruits, whole grains, and legumes are at the center of your plate. The chart below provides a handy tool for you to quickly assess where your personal fiber count measures up. On the first of each month, the Physician’s Committee runs a free, online 21-Day Kickstart program so that you can immerse yourself in a plant-based diet. 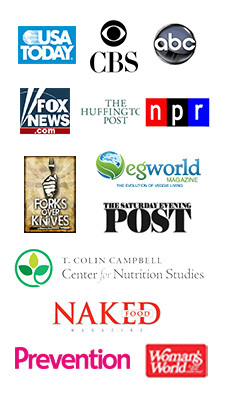 Sign up for the Kickstart here so that you get daily mailing, tips, inspirations and recipes. I am honored to one of the coaches for this program as it’s been a powerful way to reach thousands (literally tens of thousands of people!) in a supportive, regular, and inexpensive way – as there is no cost to the program. Along with the 21-Day Kickstart program come instructional videos, menus, recipes, and daily tips from the coaches – including yours truly. Question for you – how is your fiber count? And let me know if you plan to join the February Kickstart! Barnard ND, Levin SM, Yokoyama Y. A systematic review and meta-analysis of changes in body weight in clinical trials of vegetarian diets. J Acad Nutr Diet. Published online January 21, 2015. THANK you! It’s the little reminders like this that keep me motivated day after day and week after week. I count on you to make these motivators happen. There are not a lot of people in my circle of friends who eat like I do. though two of my friends have started to make changes in their diets by eating a lot less meat. It is very encouraging but a slow process. You remind me to keep it positive and also keep me connected with the research and how to best make changes and transitions. Thanks for posting this because I can now take something really specific – the fiber thing – to share with my friends. Hopefully this will not annoy! It’s a great graphic and thank you for putting it up today. Your post is music to my ears. First, that I can even in some small way assist with motivation. Doing so with facts is my ultimate fantasy which is why I am glad to post this graphic today. Second, I admire you for your strength in the face of friends who may think differently. But obviously you’ve made a difference, an impact – and been an influence. Plant-based is caught more than taught. Keep up the good work and endless thanks for sharing your thoughts today! Hi Anna! I love it when there is a timely confluence of events like this! So glad you’ll be joining us on the Kickstart, too! Inspiration – we can all use it and thank you for stopping in to share, I always love it when I see there’s a new message from Anna!